What a wonderful month January was for the children and staff. There was so much going on! We have had the Robin Hood panto in school which was really great fun and enjoyed by all. 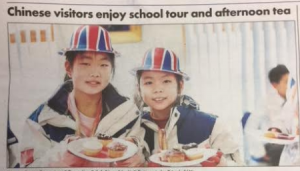 Chinese pupils visited our school and took part in lessons including PE, maths, cookery and art. The Chinese pupils enjoyed showing our children how to make dumplings, we then had the pleasure of eating them! It was all topped off with a wonderful ‘Afternoon Tea’ hosted by Y5 and Y6. The Oxford Mail did a lovely report on the day.